e-Bug have developed peer education resources for teachers to use with school aged children. Find out more below. In this fun experiment students learn how easily microbes can be spread through coughs and sneezes by recreating a giant sneeze. Students later learn that the best way to stop the spread of colds and flu is to sneeze into a tissue! Students learn about the different types of microbes (bacteria, viruses and fungi) by making different microbes using play dough. Students learn that microbes have different shapes and that they are found everywhere. By taking part in a classroom experiment students learn how microbes can spread from one person to another through touch. 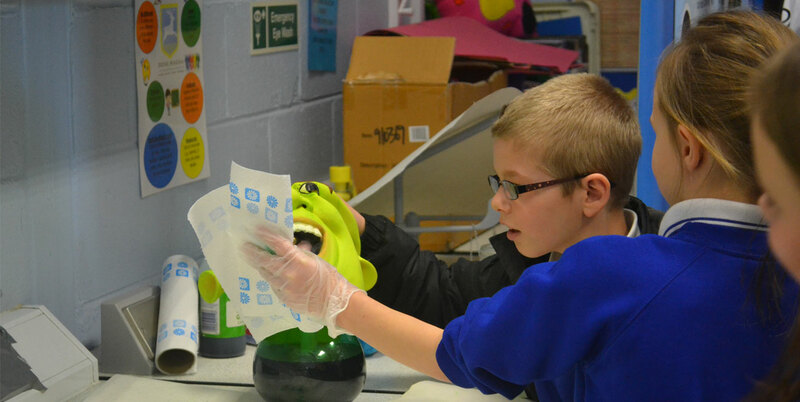 Students also learn how to wash their hands properly and why it is important. Students make a chicken sandwich and observe how far they have spread harmful microbes. Students also learn to wash hands after touching raw meat and to use different chopping boards for raw meat and vegetables. In this experiment, students learn the importance of using antibiotics appropriately, including taking them as prescribed by your doctor and taking the whole course of antibiotics. Students also learn that antibiotics are special medicines that only work on bacteria. The antibiotic activities focus around microbes, antibiotics, antibiotic resistance and practical advice on how to take antibiotics correctly. A balloon activity demonstrates that antibiotics do not kill antibiotic resistant bacteria. 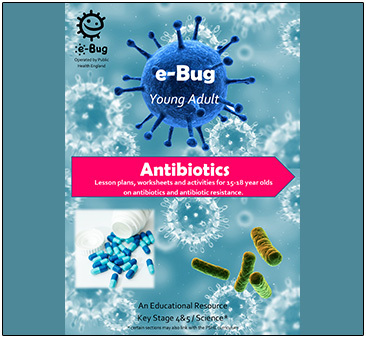 The e-Bug peer education resources are designed to be used by school aged children to teach their peers about microbes, the spread of infection, and antibiotic resistance. The peer education resources based around the e-Bug Science Show are designed for Key Stage 3 students to act as peer educators. 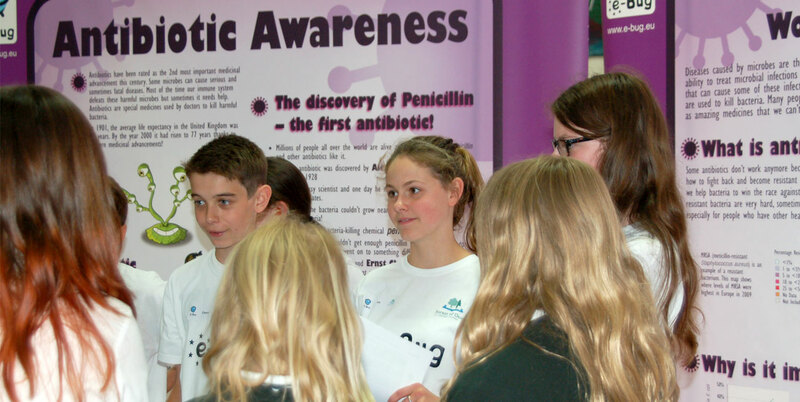 The peer education antibiotic lesson plan is designed for secondary school students or even University students. However, they can all be modified and adapted for use by different age groups. Find out more about peer education below and download the resources. 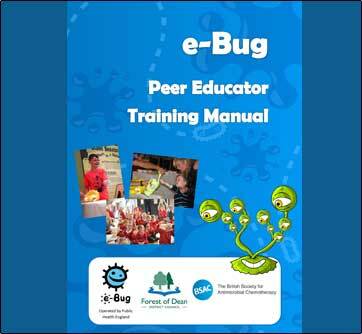 The Peer Education Training Manual will inform peer educators how to deliver the e-Bug science show activities to their peers. This pack contains all the information peer educators need to run a science show workshop in their school. The e-Bug science show contains five stands: Microbe Mania, Horrid Hands, Super Sneezes, How Clean Is Your Kitchen and Antibiotic Awareness. Please visit the e-Bug Science Show Webpage for more information. 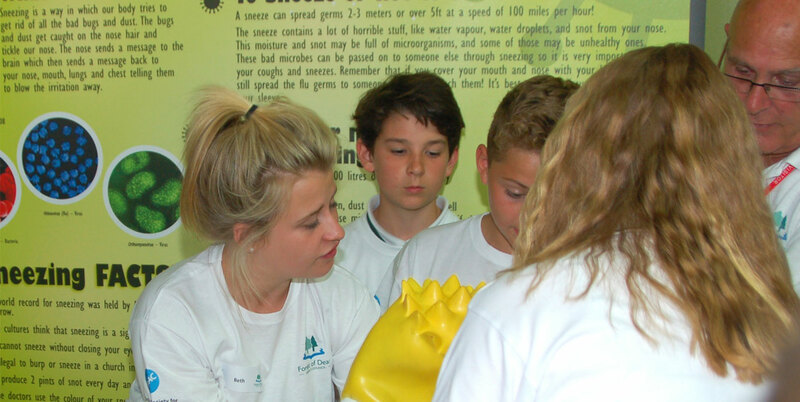 This resource pack describes the development and evaluation of the peer education workshops and outlines how the workshops can be run by schools and/or local Environmental Health departments across the country. 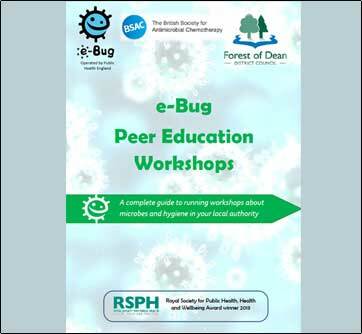 If you are interested in working with your local Environmental Health department on a peer education workshop, please contact the e-Bug team on e-Bug@phe.gov.uk. 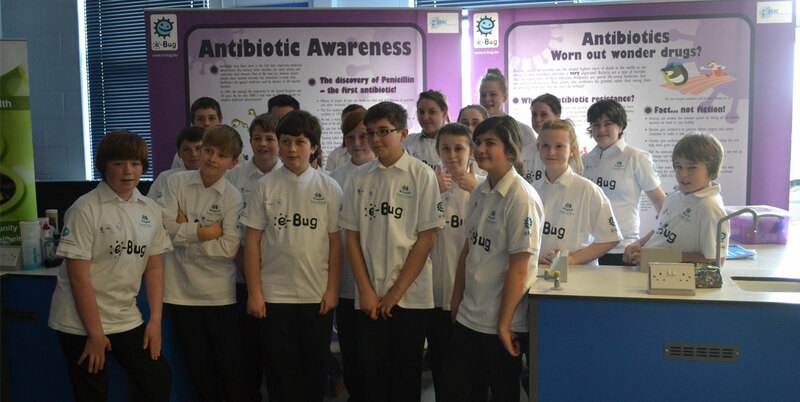 The e-Bug peer education lesson plan on antibiotics can be run in school and adapted for students aged 11 and up. 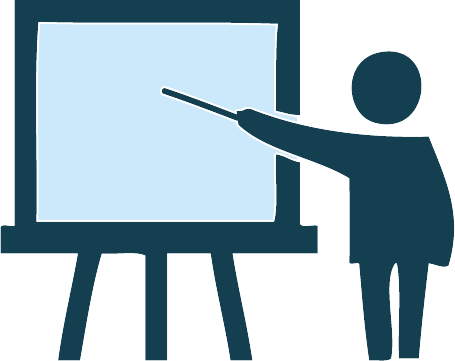 The lesson plan describes in detail how to run the lesson, including how to set up and deliver interactive activities. 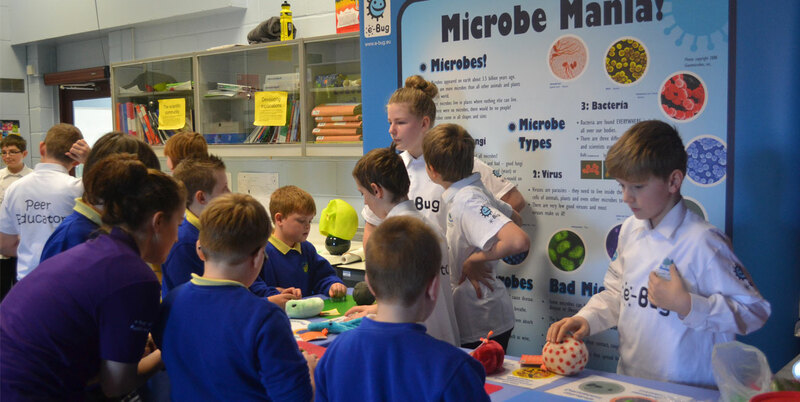 The activities focus around microbes, antibiotics and antibiotic resistance. Peer education involves the teaching of others by their peers. The basis of peer education is that the teacher and student are equals, with similar backgrounds, as oppose to the traditional teacher/student relationship. 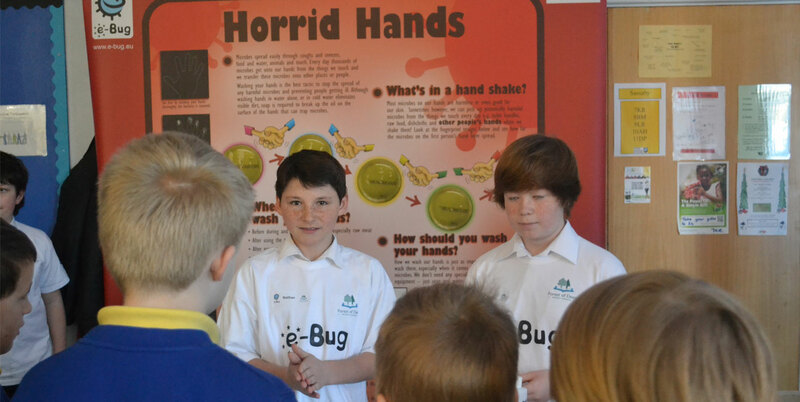 e-Bug have developed peer education resources whereby students teach other students. Peer Education is becoming an increasingly popular educational tool, both in schools and the community, due to the benefits for all involved. For the peer educators, benefits can include positive changes in knowledge, skills, attitudes and confidence, with educators developing key communication and social skills. By teaching others, students gain a deeper understanding of the topics covered and have increased knowledge in the area. Students taught by their peers can identify with their educator, which allows the development of positive relationships and a greater level of trust between teacher and student. 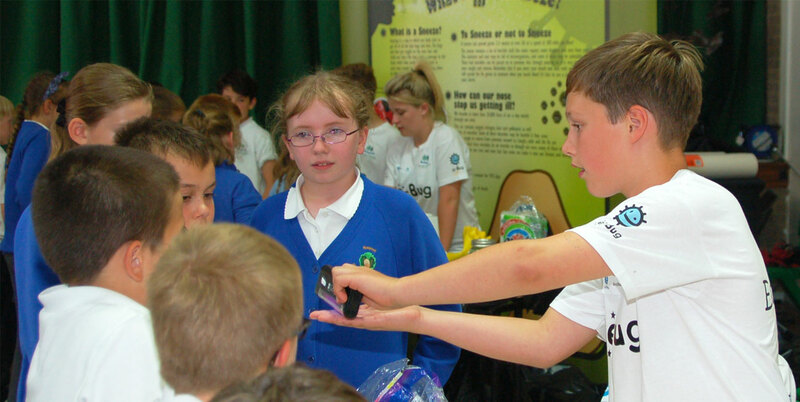 The e-Bug team evaluated the ‘Science Show Peer Education’ resources in collaboration with the Forest of Dean District Council Environmental Health Department. The workshops were evaluated with before, after and knowledge retention questionnaires as well as qualitative interviews with peer educators and teachers. 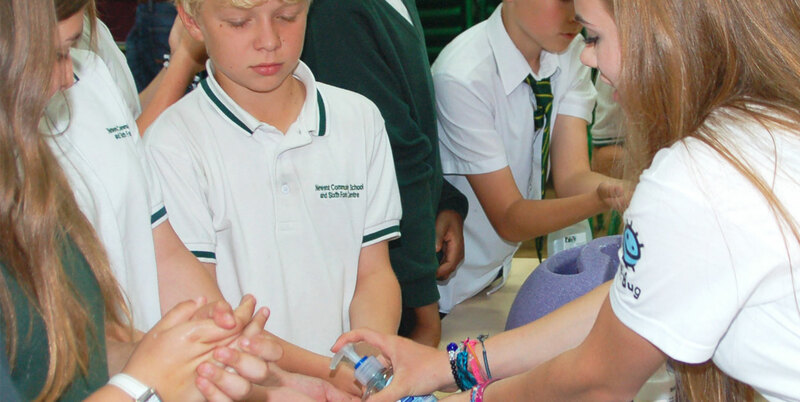 The workshops were well received by students, teachers and the school as a whole. Teachers noted how quiet and shy students grew in confidence throughout the day and peer educators were described as ‘more responsive to learning’ since the event. Questionnaires showed knowledge improvement for all topics covered, and this knowledge was retained 6 weeks after the event. If you have any questions, comments or feedback, please let us know by visiting our contact us page. Copyright © e-Bug, 2019 | All rights Reserverd.